We will explore the delightful little town of Honfleur, a real gem that has remained unaltered for centuries, retaining all the charm of those sea ports whose atmosphere is perfectly immortalised in the paintings of the great Romantic and Impressionist artists. This excursion is an opportunity to savour the enchantingly peaceful Honfleur, a picturesque fishing town at the mouth of the Seine that dates back to the 13th century and is still perfectly preserved today. 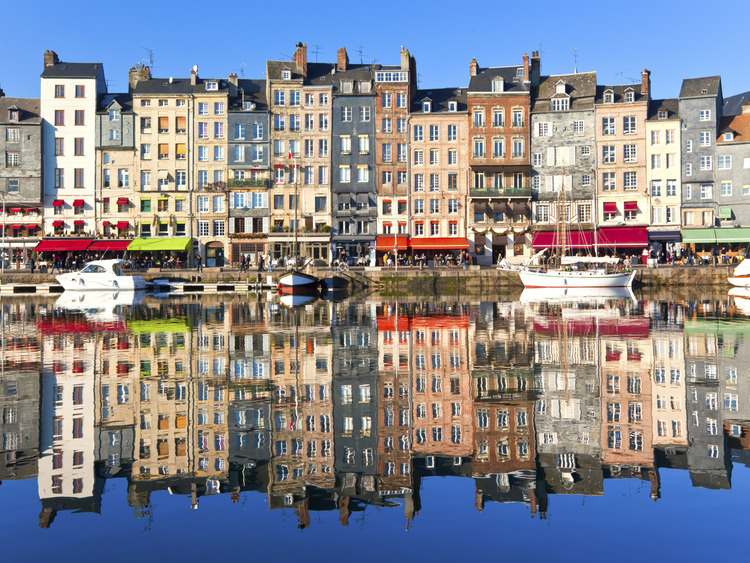 Already known as a base from which to set off on journeys of discovery, allowing France to expand its colonial territories, Honfleur is also considered the birthplace of impressionism and romantic art. To begin the tour our guide will lead us along the streets of this peaceful town with its typical wooden houses with slate roofs. During the guided tour, we admire the extraordinary 17th century port (Vieux Bassin) the lieutenant's residence (la lieutenance), the historic city gates and the enchanting 15th century church of Saint Catherine built entirely from wood. The imposing chestnut-wood clock tower rises to the side of the church and above the bell ringer's residence. With free time on our hands we can explore this pretty little town independently, stroll along the narrow streets of the port or through the historic centre and buy souvenirs at the numerous shops. The excursion is reserved for guests who do not disembark at Le Havre.